In 2005 Michael Burry discovered that the mortgage back securities that banks were selling to investors had included in them mortgages that were delinquent. This he recognised to be a fatal flaw and as history would record, he successfully engineered a long term bet against those securities in what we know today as "The Big Short". That there were delinquent mortgages in a package of securities was not unknown. The idea was that returns from the good mortgages easily covered the small losses from the bad. The problem however was that there was an insatiable appetite for these products and investors were willing to accept ever higher level of risky mortgages in their basket, to the point where these sub-prime mortgages were "manufactured" to supply the demand. Investors drew comfort from the widely held but faulty notion that house prices will keep rising and the property market will never collapse. They were wrong, and we are still living the result of that folly, with nearly 10 years of recession/depression. How is this relevant to Bitcoin? In a previous article I pointed out that as a result of Bitcoin Cash, miners now have the option to mine BTC or BCH. Bitcoin without the Emergency Difficulty Adjuster (EDA) is vulnerable to a massive drop in hashing power which would lengthen the time between blocks to hours such as happen to BCH at the time of the fork. This is a disaster that BTC would never recover from because it does not have the protection of EDA. The Bitcoin mainstream refused to acknowledge this, postulating that it would never happen and that miners will never do that. But that is not the point. The question is not if miners will or won't but if they can or could, and if it is the latter, then there is a non zero existential threat to the universally held notion of the indestructibility of Bitcoin. Investors who hold bitcoins as a store of value can wake up one morning to a black swan event that renders the value of their nest egg to zero. Projects and start-ups dependent on BTC holding value will collapse and fail. To make matters worse BTC is also limited to 1MB blocks. This means that if only a fraction of mining power is lost to the bitcoin network, block time lengthens and the mempool bloats. Without the benefit of big blocks to clear the backlog, transaction fees increases to the point where the bitcoin blockchain becomes unusable, except to those willing to pay usurious fees. Long block and block maturity time will drive miners to mine the BCH chain which is already more profitable. This causes a feedback loop which will inevitably lead to the dreaded Chain Death Spiral, and the collapse of the Bitcoin blockchain. To argue that the BTC blockchain is more profitable to mine if higher fee rewards are taken into account, is oxymoronic to the extreme. It is the argument of a bias and disingenuous supporter or a greater fool. The fees are high precisely because blocks are small. Pinning their hopes on Segwit and/or 2MB is hopelessly inadequate and unrealistic for a technology that is on the cusp of explosive growth and mainstream adoption. We must now confront the reality that Bitcoin has not 1 but 2 fatal flaws. EDA and 1MB blocks. The effects of the 1MB block is already evident with the mempool consistently over 45MB and a blockchain that is becoming increasingly unusable. In all probability, the Bitcoin blockchain is kept alive only by the good graces of miners honoring their increasingly untenable NYA agreement. Why has there been no discussions of these fundamentally important and critical issues? The answer must be fear and greed. Fear that any such discussions will lead to the fall in the bitcoin price or a move to Bitcoin Cash. However, censoring and avoiding discussions purely out of greed is downright fraudulent. We have already seen what happens as a result of greed replacing reason in the sub-prime disaster. Not to address this "elephant in the room" may lead to a total loss of confidence by the public and ridicule by governments and banks, eager and waiting to regulate and control. A new market quoted pair for Bitcoin Cash. The market capitalisation of Bitcoin Cash is in excess of 10 Billion and rising. Many investors are now aware of the problems inherent in Bitcoin and have opted to move or hedge their position with Bicoin Cash. Herein lies a problem. The value of Bitcoin Cash is pegged to Bitcoin. What happens if the price of Bitcoin goes to zero? We need a contingency plan now. Bitcoin Cash should be traded and reported as currency pairs side by side against BTC. We must demand and insist this of the exchanges. This way if BTC fails the process of transition is seamless. Contrary to popular misconception, Bitcoin Cash is the real bitcoin, and it was not a new fork, but a fork back to the original. 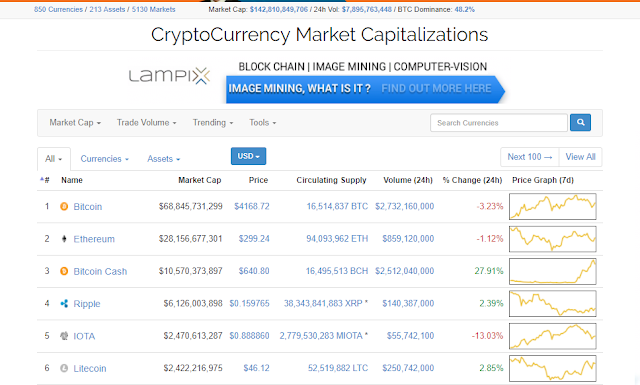 In just two weeks it has taken the number three spot in market capitalisation and will soon replace Ethereum at number two. In the process it has eroded the value of all alt coins that have gained prominence because they were allowed to exploit their specific niches by eroding use and value from Bitcoin. The community is sending a message. Loud and Clear. It is high time to put BCH back where it belongs.